Our metal barn prices South Carolina SC are listed below. We are not afraid to compare our prices against any other companies. Our steel horse barn prices South Carolina SC include 14 ga or 12 ga galvanized metal framing (12 ga framing carries a 20 year rust through limited warranty), standard 29 gauge painted steel roof paneling. We offer 13 colors for our barns. South Carolina SC Metal Barns also offers certified or non certified units. Farmers and ranchers find our metal barns to be great for storing feed, housing livestock and shelter farm equipment. Our barns are more affordable then most pole barns and much quicker to have installed. We can provide Metal Barn kits for those do it yourself customers. We carry hay barns, horse stall barns, animal barns, tack workshop barns, equipment shelter barns, storage barns and equipment barns click her for our barn gallery. Our metal barn prices South Carolina SC include free delivery and installation on your level ground or cement pad. Our Metal Barns South Carolina SC are for sale in the entire state of South Carolina SC. In addition to metal barns we also offer carports, metal garages, rv covers and steel buildings. 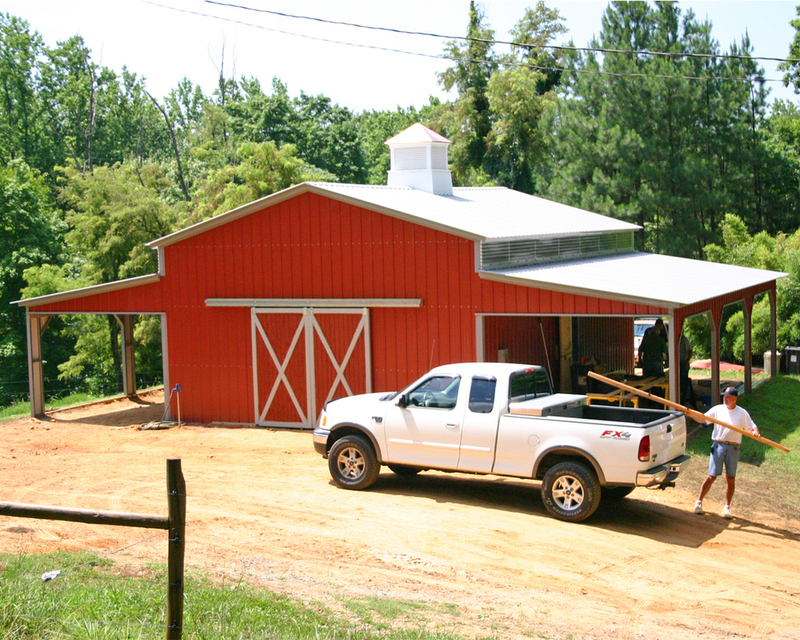 Our South Carolina metal barns are delivered and installed for free as long as your ground is level. Our normal delivery time for South Carolina is 2-4 Weeks and up to 8 weeks. So if you are looking for a great metal barn or steel barn at a great price with quality service then give us a call toll free at 1-877-662-9060 or sales@metalgarages.co. Check out our Barn Packages!! !